Place the tomatoes face down on a lined cookie sheet. Drizzle the oil and sprinkle salt and pepper. Roast them for 3 hours until soft. Let cool and scrape off any lose skin. Chop the tomatoes and set aside. Transfer the vegetables to a lined cookie sheet. Drizzle the olive oil and sprinkle salt and pepper and roast for about 30 minutes. Take out and keep aside. Heat a large frying pan with the olive oil and butter. Add the shallot and garlic. Saute on medium heat for 2 to 3 minutes. Add the tomatoes and pasta water. Bring to a boil and simmer for a minute. Add the pasta and the vegetables. Mix well and season accordingly. Heat a medium frying pan with the olive oil. Add the breadcrumbs and garlic with the salt. Saute on medium heat, stirring constantly, making sure the breadcrumbs don’t burn. Saute for 3 to 4 minutes and keep aside and let cool. Once cool, add the parsley and cheese. Mix well and top the pasta before serving. 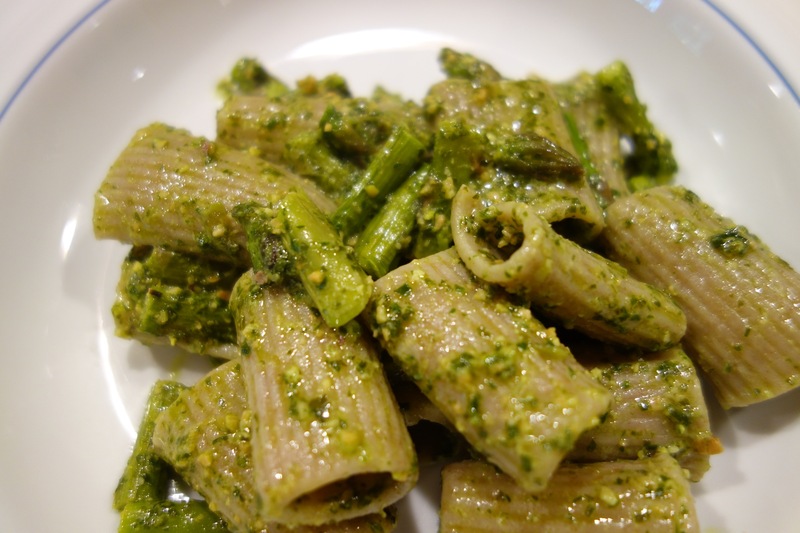 When I think of spring, I think of asparagus and I think fresh green pesto. 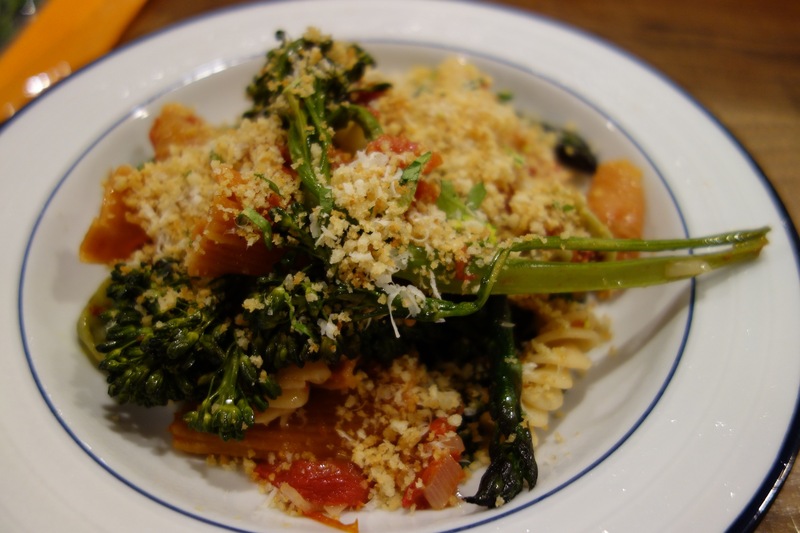 This pasta dish is a combination of both. I made a delicious parsley pesto which is very easy to make. I paired it with delicious roasted or grilled asparagus. It is a great side dish or a meal! Transfer the parsley, garlic, pistachios and lemon juice to a food processor. Process till a smooth paste begins to form. With the top open, drizzle the oil till the pesto begins to form. Transfer to a small bowl and add the salt and cheese. Check for seasonings. Cut the ends off the asparagus and cut the tops into 2 inch pieces. Transfer to a lined cookie sheet. Drizzle olive oil and sprinkle salt. Mix well and roast in oven for 30 minutes for till golden brown. Take out and keep aside. Transfer pasta to a large frying pan. Add the pesto and the saved pasta water and stir over low heat till all the ingredients have come together. Fold in the roasted asparagus and check for seasonings. 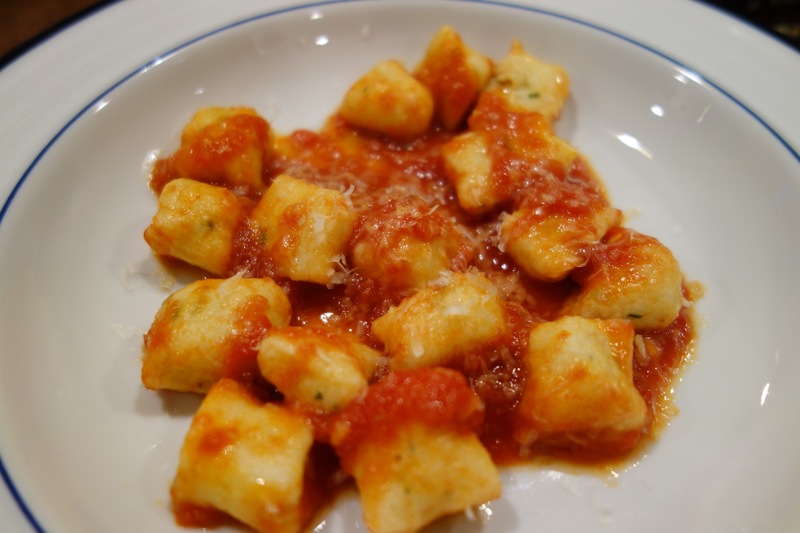 Serve with grated cheese. Heat a wide skillet with the olive oil and salted pork and fry over low heat for 15 minutes or till the fat is rendered out and the meat is crisp. Remove the pork with a slotted spoon and set aside. Add the onion and garic and sauté over medium heat for five minutes. Crush the tomatoes with hand in the can and add to the onion mixture. Cook for 20 minutes on medium heat with the lid on. Check for seasonings and add salt and the red pepper flakes. Add the raw shrimp and cook for 2 to 3 minutes. 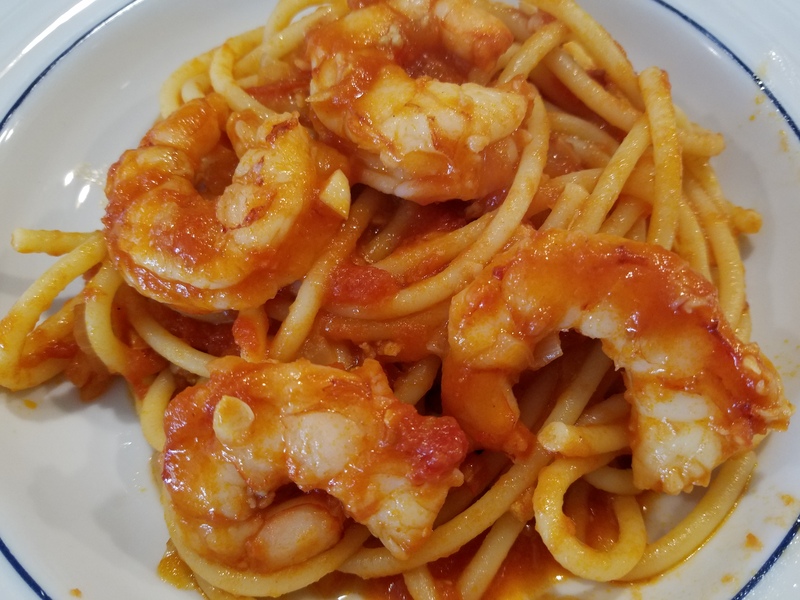 Add the al dente pasta and cook on medium for another 2 to 3 minutes, till the shrimp is cooked through- careful not to over cook. Check for seasonings and garnish with parsley. Heat a large frying pan with olive oil. Add the ground chicken and separate with a wooden spoon while sautéing over medium heat for 2 to 3 minutes. Add the mushrooms and saute for 3 to 4 minutes. Add the thyme, garlic and shallots. Saute for 3 to 4 minutes and add the wine. Mix well and scrape the bottom. Add the marinara sauce and cook for ten minutes on a simmer with the lid on. Add the cooked pasta and mix well. Check for seasonings and serve hot. Heat the olive oil in a medium saucepan. Add the pork and cook on high heat and separate the meat with a wooden spoon. Saute for a 3 to 4 minutes on medium high heat. Add the onion, garlic, thyme and rosemary. Saute for 5 to 6 minutes. Add the tomato paste and sauté for a minute. Add the tomato sauce and cook on medium heat for 20 minutes. Add salt if necessary and turn heat off and keep aside. Heat a medium saucepan and add the flour and butter. Melt the butter on medium high heat. Cook for a minute or two, stirring constantly. Slowly add the milk and whisk to make sure all the lumps are taken out. Bring to a boil and lower the heat to medium. Cook for 5 to 6 minutes. Add the nutmeg and salt. Turn the heat off and keep aside. Add the pesto and mix well. Line a 9 X 11 glass pan with a quarter cup of béchamel sauce. Cover the bottom and add four pasta sheets. 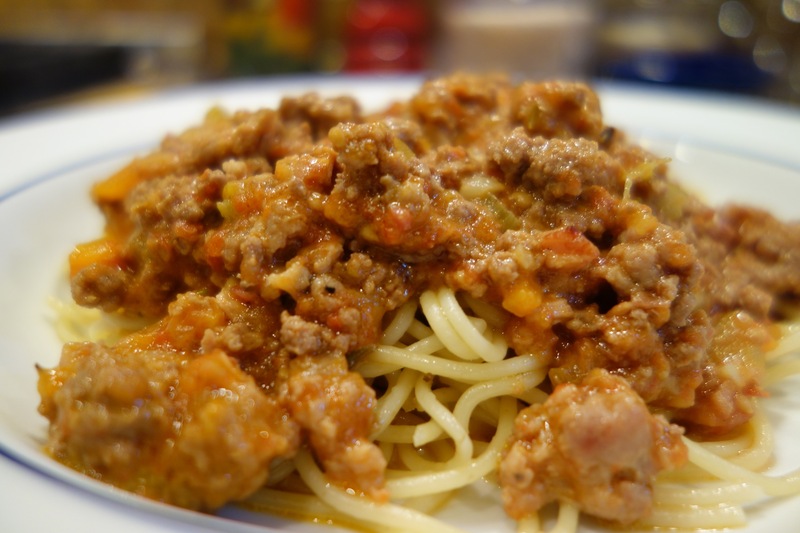 Spread one cup of meat sauce on top. Sprinkle ¼ cup shredded Pecorino. Place another 4 sheets on top. Pour about ¾ cup of béchamel sauce- spreading it all over the pasta. Add another cup of meat sauce. Add ¼ cup of shredded Pecorino. Place another 4 sheets on top and cover with the remaining béchamel sauce. Cover with aluminum foil and bake for 30 minutes. Take the cover off, sprinkle the remaining cheese on top and bake for another 15. Serve hot with salad and garlic bread. Heat a heavy saucepan with the olive oil. Add the onion, carrot, celery, rosemary and thyme. Stir and sauté on medium heat for 5 minutes. Add one teaspoon of salt. Add the pancetta and sauté on medium heat till the vegetables are soft and pancetta is crispy. Add the beef and sausage and separate vigorously with the back of a wooden spoon while stirring. Saute for 3 to 4 minutes on medium high heat. Add the white wine and scrape off all the golden brown bits from the bottom. Add the tomato paste and sauté for a minute. Add the tomato sauce, broth and milk. Bring to a boil and simmer on medium low heat with lid on for 2 hours. Stir every 15 minutes or so to check the consistency. Once the consistency is according to taste, check for seasonings and serve with spaghetti. Cook the potato till soft to the fork. Take the skin off and put the potato through a potato ricer into a bowl. Add the ricotta cheese, salt, pepper, nutmeg, thyme, chives, egg and cheese. Mix well. Gradually add the flour, one tablespoon at a time till the dough comes together and not sticky- try not to over knead the dough. Separate into four sections and roll each into ½ inch thick logs on a floured surface. 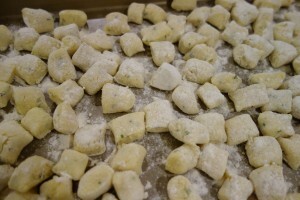 With a knife, cut bite-sized gnocchis. Place on a floured cookie sheet and let sit for an hour. Make the sauce in the meantime. Heat the olive oil in a medium saucepan. Add the onion and garlic. Saute on medium heat for 2 to 3 minutes. Add the tomatoes and simmer for 20 minutes. Taste for seasonings and add salt and pepper as necessary.